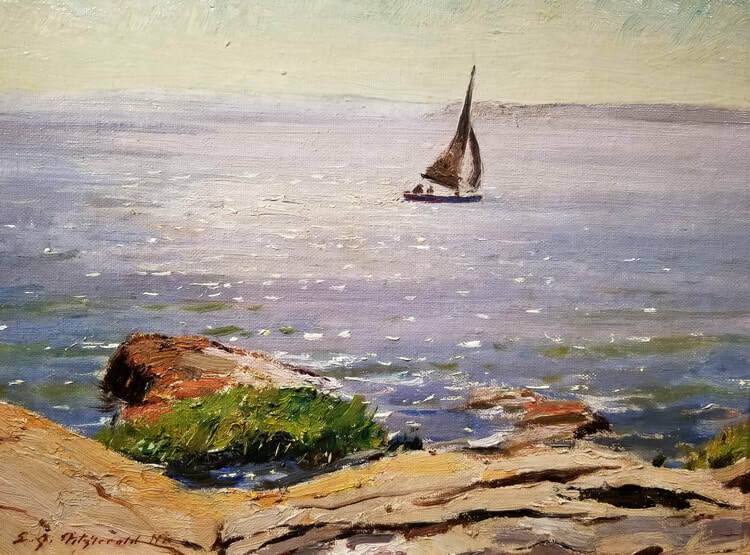 A marine, landscape and portrait painter as well as combat artist during World War II, Edmond J. Fitzgerald was born in Seattle in 1912, one of seven children. He graduated from the California School of Fine Arts. Fitzgerald served 26 years in the United States Naval Reserve. During World War II, he commanded an LST (landing craft) and had numerous subsequent combat and other naval activity art assignments. In 1940, just prior to his naval service, he married Mary Louise Streets, one of his art students who became a ceramics artist and also worked with him on murals. The couple had two children, whom Fitzgerald sometimes used as models for figure and portrait painting. In 1940, they moved to New York City, and after the War, settled in Larchmont, New York where he had a studio from where he also taught art classes. Also, he used the Greenwich Village studio of his good friend Chauncey Ryder when Ryder was on vacation, and Ryder sponsored Fitzgerald's membership in the Salmagundi Club. Teaching assignments included Newark Academy of Art, Parson's School of Design, and the New York Academy of Design. Fitzgerald was a past president of the Allied Artists of America and the American Watercolor Society, for whom he became the first Honorary President and also a regular exhibition juror. Memberships included The Artist's Fellowship and the National Society of Mural Painters.